Customer Testimonials for Newberry Ford, Inc.
August 15, 2016 14:20 Very Friendly and excellent People to work with. Great service! by Mark from Peterstown, WV. Wed Apr 20 17:59:09 CDT 2016 Always go there, always buy there; good people and great service! Best Business to Purchase Vehicles From by Christen & Brandon from Narrows, VA Thu Mar 10 08:54:18 CST 2016 We have been purchasing vehicles from Newberry Ford for several years now. They are excellent to work with and very reasonable. We always work with Richie; he does an excellent job to accommodate our requests and interests. Thank you, Richie, for being so awesome! Quality service by Carter from Pilot,Va. Mon Mar 21 19:54:00 CDT 2016 I pass at least 3 other dealerships to go to these guys. They do quality work...on time. One mechanic in particular is who does my work ...always .Matt Dillion They are all do good work and they are good people. Best car salesman ever! by Mountain Medic from Christiansburg, VA Thu Mar 10 14:37:13 CST 2016 Richie Miller is a fantastic salesperson. Very knowledgeable and extremely professional. He also worked quickly and efficiently to complete the deal when my schedule was in a crunch. Highly recommended dealer and salesman! Consistently good service! by ManyNRVmiles from Pearisburg, VA Mon Apr 11 11:43:39 CDT 2016 The people at Newberry Ford provide consistently good, honest service, which is why I've been taking my car there for years. Fantastic Dealership by Jason Conley from Narrows Va Thu Mar 10 15:09:08 CST 2016 I have bought 7 vehicles from Newberry Ford and every time my experience was awesome! Richie Miller is a top notch salesman! 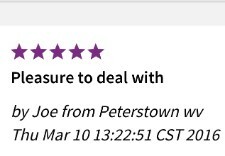 Great Deal by Dadtolots from Pembroke, VA Thu Mar 10 18:59:06 CST 2016 Looked for a reliable vehicle a while back and made an offer well under their sticker... and they gave me a great deal. Richie Miller knows how to sale a car. Vehicle now paid off and still going like a champ! Great dealership by C Martin from Lindside WV Sun Mar 13 20:28:32 CDT 2016 I have purchased multiple new vehicles from them. There sales and service are second to none and I always buy from Richie Miller. Awesome service! by Mary Shupe from Pearisburg, Va Thu Mar 10 13:31:21 CST 2016 My family buys all of their cars from Newberry! Richie Miller is the best! Great place!! by Adam from Pembroke Tue Mar 15 18:43:02 CDT 2016 Got a sweet deal on a used car!!! Mr. Richie Miller is the man to talk to! No Lot Fee!!!! by Mark from Pearisburg Va Tue Feb 02 05:56:39 CST 2016 One of the few dealerships left that doesn't charge a ridiculous "lot fee" to fatten their wallets. Efficiency by Pat from Hinton, WV Sat Mar 26 15:57:25 CDT 2016 I find the staff at Newberry Ford's service department to be exceptional. They are friendly; I don't have to wait any longer than necessary; if anything needs done besides a regular service job, the work is explained. Go see Richie Miller by Me Again Margret from Narrows Va Thu Mar 10 13:40:20 CST 2016 Bought my Chevy from there used selection from here. Great place to deal with! Again go see Richie Miller!!! Salesman by Phillip from Narrows Va Thu Mar 10 16:46:23 CST 2016 The staff, service, salesmen at Newberry Ford are all great!! That Miller sales guy is a pretty good sales person too!! Go See Richie Miller!! by Sally Shupe from Newport VA Sun Mar 13 18:27:03 CDT 2016 Richie Miller is the best salesman! He's very knowledgeable. When I need a vehicle, he's who I go to see! You won't be disappointed! At Newberry Ford, Inc. we are proud of the quality used cars we sell and our dedication to serve the needs of our customers. This is reflected in the amount of repeat business we receive. Whether this is your first purchase with us or one of many that you’ve had, you can count on our dedicated sales staff to make it the best buying experience possible.